Vinegar reduces blood sugar elevations after meals containing complex carbohydrates, according to the Department of Nutrition at Arizona State University. Meals containing carbohydrates (and to a lesser extent, proteins) raise blood sugar after meals in people with or without diabetes. [I’ve written previously about the normal ranges of blood sugars.] Previous studies established that a single vinegar dose around mealtime lowers postprandial (after meal) blood sugar levels by up to 50%. Arizona investigators wanted to know the best dose and timing for reducing postprandial blood sugar elevations. They ran multiple tests on about 40 adults who reported they were generally healthy except nine had type 2 diabetes (not taking insulin). Mealtime vinegar ingestion reduced postprandial (two hours after meal) blood sugars by about 20% compared to placebo. The test meal was white bagel (variable amounts), 20 g of butter, and 200 g of juice. The study authors suggest that the blood-sugar-lowering effect of vinegar may be related to inhibition of digestive enzymes or to a slower rate of empyting by the stomach. Remember that most of digestion and absorption of nutrients occurs in the small intestine; the stomach first has to empty food into the small intestine. Vinegar seems to inhibit digestion of starch but not of simple (monosaccharide) sugars. They also note another study that found vinegar slowed the rate of stomach emptying by almost 40% in type 1 diabetics with gastoparesis, potentially raising the risk of low blood sugar. The development of cardiovascular disease, like heart attacks and strokes, seems to be tied especially to elevations of blood sugar after meals as compared to before-meal or fasting sugar levels. This may be related to formation of free radicals and inflammatory mediators. 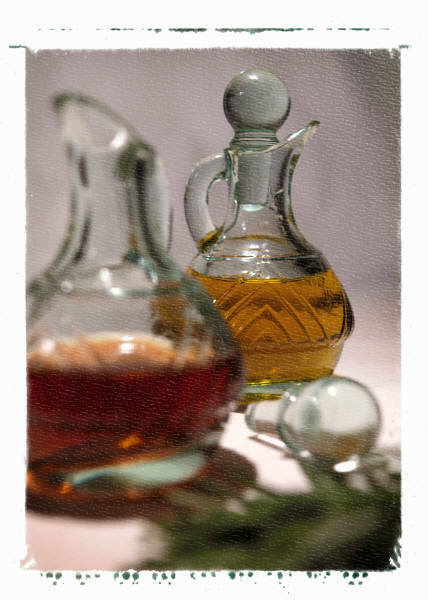 So reduction of postprandial blood sugar elevations by vinegar may be particularly helpful in preventing heart disease. It will be many years before we can prove this by a clinical study, if ever. Diabetics, especially type 2’s without gastroparesis, may better tolerate grains, fruits, and legumes—in terms of lower blood sugar spikes—if they eat them in a meal that includes two teaspoons of vinegar. Reference: Johnston, Carol, et al. Examination of the antiglycemic properties of vinegar in healthy adults. Annals of Nutrition and Metabolism, 56 (2010): 74-79. All of the glucose is still absorbed. It just changes the kinetics of absorption. How will that effect A1c levels, I wonder? Or disease state for that matter, if the patient is still consuming large amounts of carbs? A Japanese study last year demonstrated modest weight loss (2-4 lb) in overweight Japanese subjects who simply added vinegar to their diets. So maybe vinegar has some “carb blocker” effect that reduces digestion/absorption of complex carbohydrate calories. Just speculation at this point. Hi, Cody. I hadn’t heard of that problem. Guess everybody’s different.